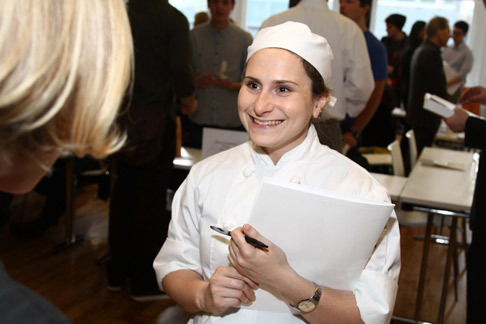 It was every culinary student's dream: Five floors brimming with potential employers like Momofuku, ABC Kitchen, The Breslin, Club Med, Food Arts magazine, and over 50 other employers excited to talk to ICC grads. No really. I asked the employers why they show up to The International Culinary Center's career fair, and they told me it was because the graduates make good employees. 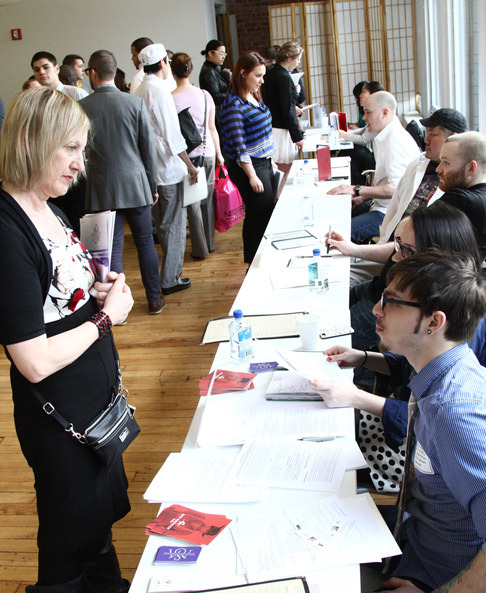 When I swung by Blue Hill's table, human resources coordinator John Jennings told me that "the overall quality of applicants here is higher than any where else." 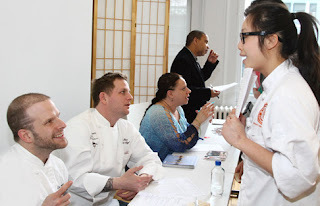 And the chefs from Marlow and Sons come every year to The International Culinary Center's career fair because it's their main source of recruits. Why? Because they know what they're getting, they said. 1. Make the commitment. If you want to get your feet wet in this industry, you need to commit to it, said Executive Chef Sean Rembold at Marlow and Sons. At his restaurant, he wants interns to commit to at least three shifts a week because you'll be working on the line (read: not demoted to prep work) and need to learn the ever-changing menu. But if you buck up and put in the hard work, you'll become part of the 70 percent success rate they have of hiring interns to work full-time. 2. Be fast, but accurate. David Burke Kitchen's pastry chef, Zac Young, said it best, "We don't want you to butcher something, but we also don't want you to pick mint for a half hour. I appreciate perfection, but there has to be some sense of reality." Bottom line? Practice your knife skills while you're in school and at home. 3. Be humble. "You're not an expert until you've seared 700 bass," was what Chef Rembold explained about cooking. Cooking is a trade, and it takes practice. Don't walk into your first day on the job with the mentality that you're going to teach the executive chef how to cook something because it'll take years of practice to perfect it. Watch and listen. 4. Come prepared. Shockingly, a lot of chefs said the biggest mistake students make is they forget to bring the essentials: a knife, kitchen shoes, and a hat. If you don't show up prepared, they won't take you seriously. And that also means showing up with a sharp knife. 5. Ask questions. Carry a small notebook with you and don't be afraid to ask thoughtful questions, said Chef Charles Imbelli at the Marcus Samuelsson Group. Chefs want to see proactive line cooks who don't need to be told to do things--they want cooks who can sense when to hop on a new task before being asked.